Bobby Rogers of The Miracles R.I.P. Jason and the Argonauts (1963) was the first film I can remember watching all the way through. The second film I can remember watching all the way through was The Wizard of Oz (1939). In those days it was shown every year on network television. In those days when VCRs were uncommon and DVRs were science fiction, the annual airing of The Wizard of Oz was one of the television events of the year. I rather suspect that few films were as heavily viewed as it was every year. Even though I saw The Wizard of Oz every year of my childhood and I would see it many more times as an adult, it remains one of my favourite films of all time. Indeed, it is perhaps my favourite musical and, except for It's a Wonderful Life, my favourite fantasy film. It is because of this that I both looked forward to and dreaded Oz: The Great and Powerful. As a prequel to one of the most beloved films of my childhood, I worried that it could prove unworthy of not only its predecessor, but of the classic books by L. Frank Baum upon which both films are based. It is an unfortunate fact of life that prequels, sequels, and remakes of classic films made many years after those films often tend to be very, very bad. It was quite possible that Oz: The Great and Powerful could have been a travesty along the lines of the TV miniseries Scarlett or the 1998 remake of Psycho. What gave me hope was the fact that it was directed by Sam Raimi, a director whose work I have admired since the Evil Dead movies, and that the trailers did look rather impressive. Fortunately, any fears I had were not justified. While Oz: The Great and Powerful is not a film of the same calibre as The Wizard of Oz (let's face it, only a very few films are), it is a worthy prequel to that classic film. Not only is Oz: The Great and Powerful a worthy prequel to The Wizard of Oz, but it resembles the original film a great deal. The film's beginning set in Kansas is even shot in black and white, just as the beginning of The Wizard of Oz was. Of course, here I must point out that the reason both films portray Kansas in black and white is the simple fact that in the original novel The Wonderful Wizard of Oz, L. Frank Baum describes Kansas as "grey (no less than seven times, in fact)." Oz: The Great and Powerful goes even further than simply giving us a monochrome Kansas in duplicating the look of the original film. From the Emerald City to the uniforms of the Winkie Guard, the Land of Oz in Oz: The Great and Powerful looks much like the Land of Oz in The Wizard of Oz. Not surprisingly, then, the visuals are one of the film's strongest points. While the Oz of Oz: The Great and Powerful resembles the Oz of The Wizard of Oz, it is a much more detailed Oz. It is a land of mountains, woods, lush valleys, and even the even lusher Deadly Poppy Field. The special effects in the film are impressive even in these days when we have become so accustomed to computer generated imagery. The tornado that sweeps stage magician Oscar Diggs off to the Land of Oz is an incredible piece of work, as impressive today as the tornado of The Wizard of Oz probably was in 1939. If anything the Flying Monkeys are even more terrifying than they were in the original film. Perhaps the most impressive piece of special effects is to be seen in the character of the China Girl (voiced by Joey King). The China Girl is not a girl from the nation of China, but instead a girl made of china (the ceramic material often used for dishes and tea cups to this day). She both looks and moves very realistically, to the point that it is hard to believe that she is simply the product of CGI. Mitchell Kapner and David Lindsay-Abaire clearly did their research. While Oz: The Great and Powerful is visually stunning and draws upon L. Frank Baum's original books as well as the 1939 film, those things alone would not keep it from being a bad film. Fortunately, Oz: The Great and Powerful benefits from a strong screenplay and some truly good performances. Messrs. Kapnger and Lindsay-Abaire's screenplay is deliberately paced, avoiding the trap into which so many modern films fall of not talking time to develop either their characters or their milieu. What is more it is written in such a way that both children and adults can equally enjoy the film. Perhaps my only complaint with the screenplay is some of the dialogue. While the dialogue is intelligent and realistic, there is some of it that strikes me as a bit too modern for the era. While the phrase "take five" most certainly came about in the early 20th Century, I don't think it was as early as 1905. This is a minor complaint for me, however, and it didn't really detract from my enjoyment of the movie. As to the performances in the film, James Franco as Oscar Diggs is not only the star of the film, but gives the very best performance in it as well. Before Oz: The Great and Powerful was even released, I had thought that James Franco vaguely resembled a yong Frank Morgan (who played Oz in The Wizard of Oz). Through his performance he convinced me that this was indeed the same man as the Wizard of the 1939 movie. James Franco plays Oscar Diggs as I could actually believed he was when he was younger--a man who is not only a humbug, but also a bit of a con man and even a bit of a lothario. It is a performance touched with both comedy and seriousness, and it easily makes the movie. The other actors also deliver solid performances. Michelle Williams is quite convincing as Glinda the Good Witch, her performance consistent with that of Billie Burke in the 1939 film. Joey King and Zach Braff did great voice work as the China Girl and Finley the Winged Monkey respectively. Rachel Weisz and Mila Kunis both do quite well as the witches Evanora and Theodora respectively. Over all Oz: The Great and Powerful is a very entertaining film that can be enjoyed even if one has not seen The Wizard of Oz (1939) or read L. Frank Baum's books. It is also a fitting companion piece to the 1939 film that actually does justice both to it and the works of L. Frank Baum. I can easily see watching the two films back to back once it comes out on DVD. 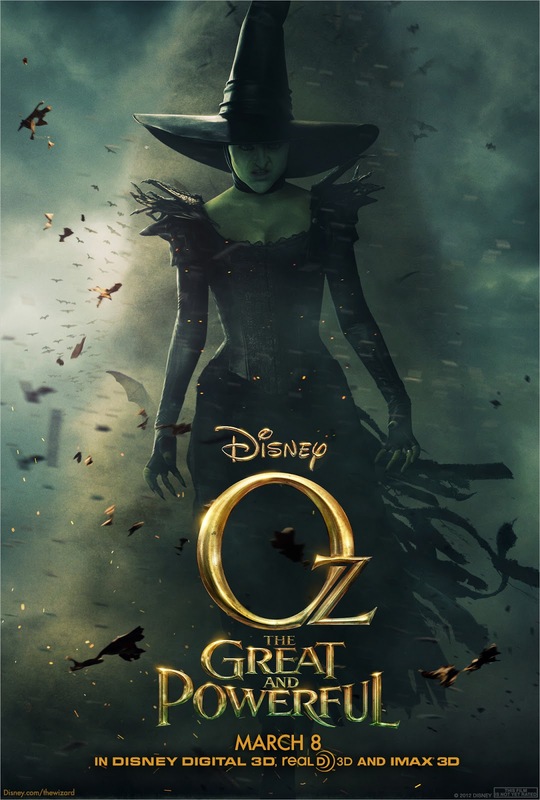 If you loved the original movie, love L. Frank Baum's "Oz" books, or simply enjoy well done films that owe more to the Golden Age of Hollywood than modern day special effects spectaculars, then Oz: the Great and Powerful may be for you. I trust in your judgement, so this is very reassuring to read. Still wish Robert Downey Jr. had stayed with the project (in my mind, he's built more like Frank Morgan), but I'm not going to stand in the way of totally immersing myself in the experience. Thanks! Your well-expressed thoughts convince me to wander over to the Cineplex and give it a go.